So I made a DIY photo booth for a friends engagement party! It was so easy to make the props I thought I would share. First I will start with the booth it self. I bought some foam board and cut it too look like a Polaroid picture and just wrote on the bottom "Engagement Party". It was hung from the ceiling and was definitely a blast for everyone to use at the party! There are also different ways where you can have a photographer or rent a reel photobooth for your wedding but they can get pricey. I've also noticed that the props are pricey too if you buy a bundle of them or they go back with the photo booth rental. I made mine and I can reuse them time and time again! First I had to decide what props I wanted to use. 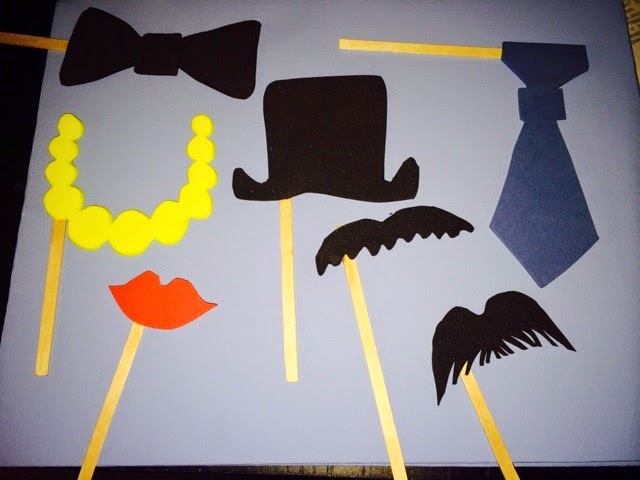 I drew on the foam paper mustaches, top hats, lips, glasses, ties, champagne glasses, necklaces and much more. Whatever you want! If you are having trouble deciding or you have a certain theme you would like to meet you can just google ideas. If you aren't very good at drawing you can print out images to trace onto the foam paper. Second I cut the foam pieces out with the scissors and glued them onto the Popsicle sticks! Then you are finished and ready to invite your friends and start taking pictures!! Picture Window theme. Theme images by tomograf. Powered by Blogger.